The genus name Cyperus is from Cypeiros which was the ancient Greek name for the genus. Rotundus is Latin for round and refers to the tuber. Grown in tropical areas and along roadsides, sandy fields and cultivated ground in such countries as the Bahamas, Java, Samoa, China, Japan, Egypt, Sudan, Turkey, Iran, India, France and Venezuela. 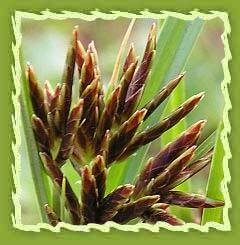 It is a smooth, erect, perennial sedge. Its tubers are white and succulent when young, turning brown or black and fibrous with age. The erect, simple culms are smooth, solid and triangular in cross section. The culms are frequently up to 36-40 cm tall, occasionally to 70 cm, and have been found to reach 100 cm on moist fertile soils. The leaves originate from the base of the plant. Chemical constituents: Nagarmotha oil has various chemical compounds that include cyperone, selinene, cyperene, cyperotundone, patchoulenone, sugeonol, kobusone and isokobusone. Extraction: It is extracted by the steam distillation of roots. Nagarmotha essential oil is good for anorexia, vomiting, diarrhoea, intestinal bleeding, dysentery and specific and non-specific colitis. It has very good digestive and carminative properties. Nagarmotha essential oil is helpful with bronco-pulmonary congestion, mucus, scabies and scanty periods. It is an effective killer of intestinal worms, a diuretic and anti-pyretic medicine. It is also described as an anti-inflammatory medicine, a general and nervine tonic, a promoter of uterine contractions and an excellent binder of stool. The essential oil is also used in various other ailments like fever, burning maturation, skin diseases, rheumatoid arthritis, painful menstruation, neurasthenia, general debility, kidney stones, fibromyalgia, gout and other uric acid sensitive conditions. Nagarmotha essential oil helpful in bronco-pulmonary congestion, mucus, scabies, and scanty periods. Nagarmotha essential oil has very good digestive and carminative properties, nagarmotha essential oil is an effective killer of intestinal worms, a diuretic and anti-pyretic medicine. Nagarmotha essential oil may also be useful in kidney stones, fibromyalgia, gout and other uric acid sensitive conditions. Nagarmotha contains pinenes and cineole. It is a neutral waxy substance and is used as a hair wash and treating hair and scalp disorders. It dilates the small capillary and acts on the sebaceous glands at the hair root and stimulates them. It has been in use for centuries for anointing body. It is also widely used for skincare, loose motions, excessive thirst and for reducing swellings. Nagarmotha Oil is used in perfumery compounds and in the manufacture of soaps, medicine, cosmetics and incence sticks. The use of Nagar motha essential oil is predominantly export oriented. Around 75% to 85% production is exported to European countries.